PC-2-Phone comes with all BananaCall plans for no extra cost, and allows you to make international calls directly from your PC - to any number (cell or landline), anywhere in the world. All you need is a PC with internet access and a headset. 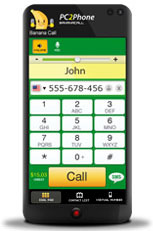 Using Pc-2-Phone is as simple as dialing from your phone, yet much more convenient. Watch the video below to see exactly how it works or you can download the application right now for free and start calling!